Well we have all made it through the winter. The Winter of winters! After all these years of less snow, it was good to see its return. But it did get a little overwhelming at times. We had to get our shoveling muscles toned up to deal with it all. So! We are ready for Spring and the Spring Gallery Walk scheduled for May 10th. Come out and see all those other people who were buried for several months. Have a drink on us and relax and visit and peruse all the beautiful new art and jewelry we have. Lighten up your wardrobe with a bright new scarf or Easter egg tone necklace or ring. Brighten the mood in your home with a fresh piece of art---one that reflects your current style and mood. If engagement is in your thoughts, come in with your lover and get some ideas for rings and wedding party jewelry. We have lots to choose from and are also happy to make a custom piece just for you. Come on out of that hole you dug this winter and enjoy one of Durango’s most loved events of the year. We look forward to seeing you! THANK YOU to everyone who has been a part of our 8 years of business in Durango, Colorado! We appreciate all of our customers who have stuck with us since the beginning and those of you who have found us more recently. Durango is such an amazing supportive community and we are so grateful to all of you that have kept our little art gallery in business. Of course nothing would be possible without our incredibly talented artists and jewelers. They are always surprising us with their exceptional creativity. It has been our goal over the past 8 years to create a collection of innovative, inspirational art that can transform any space. We are constantly rotating work, with new pieces arriving weekly. Stop by or browse the website to see what is new! Last but not least, a big thanks to all of the gallery employees, without whom none of this would be possible. We truly have a warm and friendly staff who are a pleasure to work with. They all continually go the extra mile to make shopping at Diane West Jewelry & Art an exceptional experience. Thanks to all who attended our recent gallery walk. It was a good night filled with lots of fun. This year, we had a 20% off sale on all of our art and some of you got to take advantage of that opportunity to make that purchase that you were considering. If you are not signed up on our email list, please do so and you will get notice of all special events and sales in the future. We are having the most amazing fall with ideal temperatures and beautiful colors. We miss the monsoons but appreciate these days nonetheless. Fall is a great time to consider some redecorating, rearranging and replacing art that no longer inspires you. You will be so happy you have something new to enjoy during the upcoming winter months indoors. Watching Bridgette in her studio felt like catching a glimpse of an animal in its natural habitat. The grace with which she moves metal across wax, the ease she exudes while applying flame to her work, and the practiced motion of brush to wood all spoke silently of the thousands of hours she has spent in this beautiful meditative practice. It is no mystery how her work conveys such emotion after observing her create in her small studio deep in the woods. The surrounding trees have a palpable presence which surely permeates every aspect of life there, creeping into consciousness and making their presence felt in the very artwork which depicts them. I have always admired how her work captures the feeling of the forest and seeing her surroundings made it much easier to understand how she can speak this language of the natural world through her paintings. Doodles---playful doodles throughout the gallery. Many of our artists seem to be creating lighthearted, often unstructured, summertime art and jewelry. 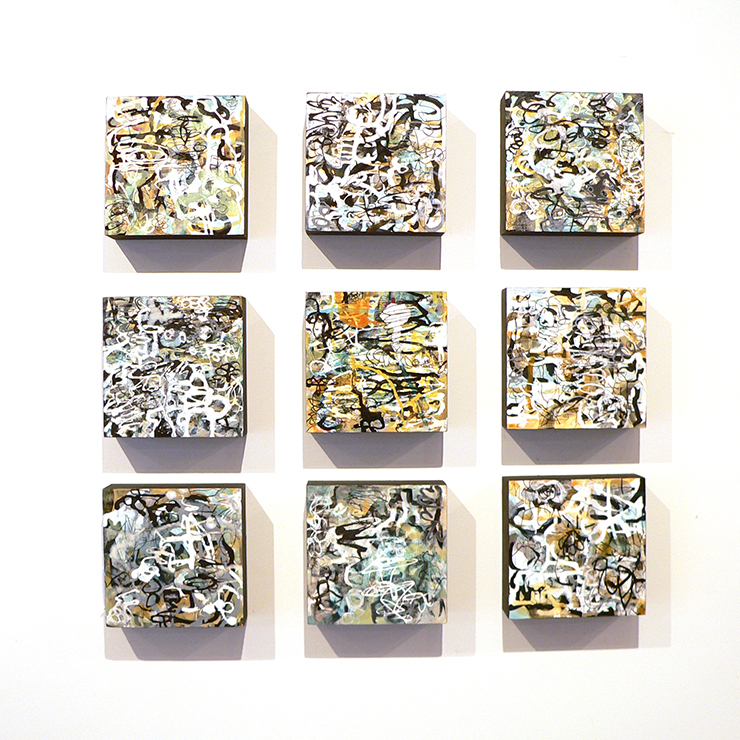 Barbara Fisher’s 6”x6” and 8”x8” paintings are a perfect example. Her skill is obvious, but the process appears to be sheer joy with endless squiggles of dark and light and hints of golden light. Gretchen Magwitz has fused sterling spirals to a round earring, thus achieving an artistic and fun earring that makes you want to laugh out loud! Lisa Pedolsky has achieved something similar in her new ruby series wall platters. Circles cut out seemingly at random and placed just perfectly on a textured background making ceramic art pieces like no others. 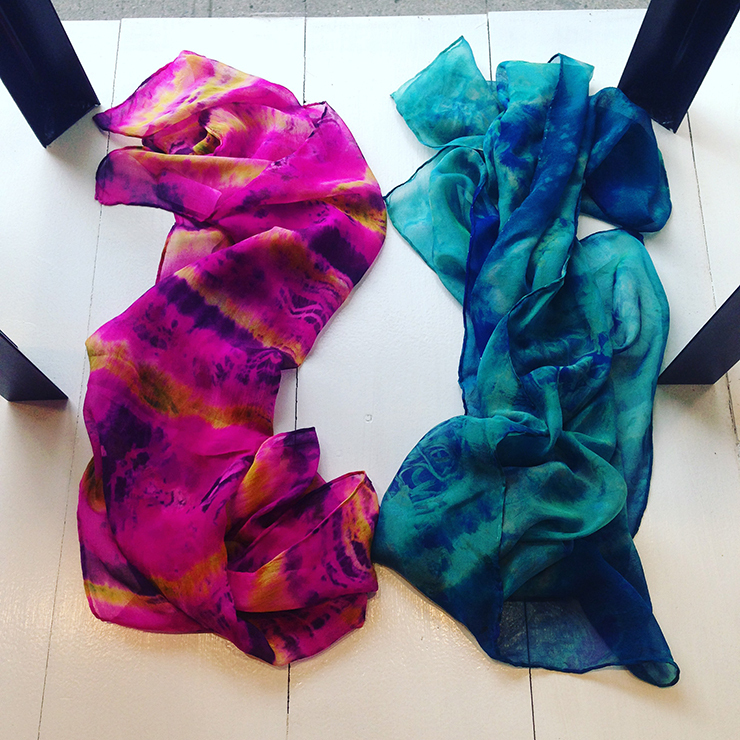 Telluride Silk Designs’ new long silk scarves are jewelry; they are art, and they are useful for both summer and winter and are a great gift idea. Each one is different, but they are all fun and colorful and beautiful. Joan Russel’s new “Optimistic” series of small 8”x8” paintings are another example of her fun approach to small art pieces that mix well with other art. Also, her small ceramic meditation boxes are almost sold out, so if you are one of the many patrons collecting these gems, now is the time to complete your collection! Today we celebrate independence, so it is a good time to celebrate our many independent, local businesses and in the case of our gallery, we celebrate the individual style of each artist, jeweler and client. Our artists and jewelers are free to express themselves in very individual ways. There are no rules. And the result is unmatched beauty. Freedom of expression! But freedom of expression should not be confused with lack of skill or sloppy execution. The artists who show here are carefully vetted. They take pride in their chosen medium and pay attention to the details. Whether it's earrings, necklaces, rings or one of a kind wedding bands each piece is handmade with care. For those born in July, we have sapphires of many colors in jewelry art by Gretchen Magwitz, Allison Kalaway, Harmony Scott and Mary Orsini. We also have a series of ceramic “Ruby Plattters” by Lisa Pedolsky with beautiful shiny ruby colored dots. Please come by and enjoy these remarkable works. Blue skies have returned to Durango! Clear air has returned. Blue skies have appeared again! We are all feeling very grateful to the incredible firefighters who have done an amazing job subduing the wildfire in Durango. So, maybe it is time to celebrate Nature and all her incredible gifts. We are featuring some of the Earth’s most beautiful gemstones in locally made jewelry. From uncut diamonds to luscious pearls and sapphires in all colors of the rainbow to dreamy blue aquamarine (below). Our contemporary landscapes pay homage to the amazing beauty that surrounds us. From ethereal mountain scenes to grassy slopes and rivers to red rock scenes, all are reminiscent of this special geographic landscape. We continue to be amazed at the outpouring of support from our local patrons who understand at a deep level the impact of this challenging time we are all going through. Without your continued loyalty, we would be reeling. Thank you all! We appreciate your continued support more than you can imagine. The Durango art scene remains strong and vibrant thanks to you! If you are in Durango for the first time, you will likely be disappointed because of the wildfire, thinking that you can’t do some of the typical Durango activities. Worry not! There are lots of things you may have otherwise missed in your eagerness to see and do it all. Durango is home to many great local businesses, unlike many towns. We have a great local bookstore, shoe store, outdoor clothing and equipment stores with helpful, knowledgeable staff. We also have fantastic restaurants and locally owed clothing stores and galleries to find the perfect gifts or treat for yourself. You can browse to your heart’s content and try things on in person. At Diane West, we specialize in one-of-a-kind handmade jewelry and beautiful contemporary art. Much of our jewelry and art is made by local artists, so we are available to explain the process as well as identify materials used. As artists, we love what we do and we love to discuss it with our potential customers. On our website, you will see that we carry only well-made jewelry. We focus on the details and it shows. We use very high quality stones and many of the them are custom cut for a look that is unique. We carry both gold and sterling jewelry, as well as high karat gold fused to steel for the mixed metal appeal. Much of our merchandise is on our website, but we have an extensive back stock of both jewelry and art, so please feel free to contact us about additional work by any of our artists. Many also offer custom work upon request to guarantee a perfect fit and enduring enjoyment. Do you know you want to pop the question, but don’t quite know how to acquire the perfect engagement ring and still retain the element of surprise for an unforgettable moment? We can help you arrange that and still include your partner in the final decisions to ensure that you are both happy with the final result. Although we haven’t yet had winter, it is starting to feel like Spring! And with Spring, we begin to think of Summer weddings. If you are one of the lucky ones, we would like to be a part of your special day. We specialize in locally made custom wedding rings and offer a variety of unique diamonds and other stones to choose from. Our jewelers can work with you to create handmade, keepsake bridal gifts and bridesmaid ‘s jewelry. For the upcoming anniversary, we will assist you in choosing the perfect, unique piece to express your continued love and commitment. Birthstones can be the perfect gift for a loved one. We carry many precious and semi-precious gemstone rings, necklaces and earrings. To create a meaningful family gift, consider a piece of jewelry with a stone for each family member. We offer options in all price ranges. If you are one of the growing number of people who want to shop locally, we specialize in locally made jewelry and art. We appreciate our loyal local shoppers and we strive to make your shopping experience fun and rewarding. Shopping errors are easily corrected with our 30 exchange policy, so shopping is risk-free! Jennifer Jung unveiled 7 new landscapes at her April 14th show. For those who were lucky enough to attend and view the work in person you know there is only one word needed to describe her new work. LIGHT. In what might possibly be her best work to date the images are absolutely luminous. You can almost feel the breeze coming off the images of water and cloud, mountain and stream. Standing before them you are lured into the nostalgic beautiful scenes and swept back to memories of dusk and dawn. The new paintings are slightly more minimal then ones past and the increased simplicity of the work is all the more inviting. The eye is drawn in and the heart follows. We had a great turnout for Spring Gallery Walk this year! Our featured artists were Bridgette Meinhold and Margie Woods and we were fortunate to have both in attendance. Margie Woods, of Venice, California unveiled her newest series "Following a Thread" and Bridgette Meinhold of Park City, Utah brought her newest encaustic landscape works. Thank you to all of our valued customers and artists who have made it possible to celebrate 4 years in business as a Durango art gallery!! You are all invited to join us for food, wine and fun on the evening of good Friday. Kelly Schurger's dreamy landscapes can appear almost photographic from a distance but once drawn in the viewer can't help but ask, "is this real or imagined?" Wispy clouds, soft green hills and snowy mountain peaks often grace Kelly's canvases, and grace is perhaps the only way to describe her balance between strength and softness, shadow and light. Her work captures the emotion of a stunningly beautiful scene or the peace we feel when the light has changed just slightly, just enough to make everything appear soft and calm and timeless. Kelly contends that her highest goal is to remind us that beauty is always all around us. She succeeds. Don't miss this opportunity to see her newest and most powerful work. Down in the Valley oil on canvas 30" x 72"
The Light of Summer oil on canvas 30" x 60"
New work has just arrived by Patricia Oblack! January (and winter in general) can feel like such a dark, cold expanse. What better way to lift our spirits then with art? The beauty and comfort of the space we create in our homes is especially important this time of year. Patricia Oblack has spent decades mastering the practice of translating music, landscape, dream, emotion and event into color and brushstroke. Though her work is sometimes bold and other times subtle, it never fails to evoke feeling from the viewer. Multiple layers of acrylic weave stories that reveal themselves slowly. Her paintings can not be taken in at a glance, they demand time and attention to unfold their secrets. Part of the satisfaction of living with an Oblack piece is the way that her artwork can shift for the viewer over time. Strong enough to transform a room, yet refined enough to offer a sense of calm, Oblack's work never disappoints. Thank you friends and customers for coming out and making fall gallery walk successful and fun! If you were here then you were lucky enough to try Pat Hartman's (now famous) gluten -free pecan shortbread cookies. At the event and after I had MANY people inquire about the recipe so I thought the easiest thing would be to post it online. So here it is! In a large bowl combine almond flour, salt, baking soda and pecans. In a smaller bowl, mix together agave, butter and vanilla. Mix wet ingredients into dry. Place dough in the center of a large piece of parchment paper and form into a large log approximately 2 1/2" in diameter. Place in freezer for one hour, until firm, unwrap and cut into 1/8" thick slices. Place slices on a parchment lined baking sheet. Bake at 350 until lightly golden, 7-10 minutes. Thank you to all of our loyal customers! We are so honored that you voted us best jewelry store in Durango. The birthday gifts, anniversary gifts, engagement and wedding rings and the spontaneous purchases that have delighted the recipients have also delighted our many jewelers who put so much creativity and skill into the hand-made creations. It is a true win/win and we are grateful beyond words for your loyalty. Diane West, the owner of the gallery has made countless engagement and wedding rings, often centered around a one-of-a-kind diamond and has thereby proudly participated in the joy of the special event. She continues to create her beautiful, gemmy rings and pendants that make her customers return again and again for another. Diane’s simple, classy, artistic jewelry has universal appeal, making it a very good choice for a special gift. Tracey Belt, a local jeweler, joined our gallery in the last year and we are delighted to have her. Tracey is the local expert in enamel techniques and produces the most incredible belts (Belt’s belts!) and leaf motif pendants. They have flown out of the gallery, on the wings of her delicate bird pendants. Tracey is also an amazing glass bead artist, taking the time to make her own luscious colored glass beads that she incorporates in her original designs. She rounds out her jewelry line with her very popular spiral earrings in either sterling silver or 14 karat gold. Harmony Scott, of Carbondale, continues to design unique gemstone pieces that are then made by a family in Bali. This not only keeps the prices of her beautiful pieces very affordable, but helps to support that family---both very worthy accomplishments. She uses beautiful quality stones and often gives them a leafy look with unusual and meticulous wire work. Her necklaces, bracelets and earrings are always new and fresh. Susan Kinzig is a San Francisco artist specializing in polymer and sterling. She is able to produce the most amazing colors that she combines with sterling silver in botanical forms that are very flattering when worn. She combines colors and shapes that can be mixed and matched. To see her work is to appreciate it! Susan Kemmerly, another of our local jewelers takes advantage of her OCD and creates jewelry that is as beautiful as it is unique. She is one of a very few bead artists in the country who are able to maneuver through complicated beaded bead patterns. She is an expert with her color combinations and somehow her pieces go with everything! Susan frequently texturizes the sterling silver components, making each item a unique masterpiece. Nicole Hansen is from Salida, where she alloys her own sterling and drops the hot metal into water to form ingots that she then embellishes with small gemstones. The ingots are reminiscent of pebbles, lending an understated approach to rings, pendants and earrings. Her jewelry often turns into that favorite piece that can be worn daily. Pyper Hugos, of Montana is the ultimate environmental jeweler! She re-purposes old car metal into unique jewelry with a lot of impact. She incorporates small gears and geometric shapes that are often another color on the reverse side. Her designs are quite artistic and because her materials don’t cost much, you can purchase this jewelry for inexpensive gifts with lots of style. Kristin Lora, now living in the Portland area makes our most whimsical jewelry. She uses small railroad figures in her sterling and gold fill earrings, so you may have a skier or giraffe nonchalantly hanging through a hoop earring. She also makes our most versatile travel jewelry—the long chain necklace that can be worn three different ways and is available in sterling, gold fill, or a combination of the two. Pat Hartman, of Durango, has a love of all the endless possibilities for combining colors with gemstones to create the magic that stones are purported to convey to the wearer. Even if you are not a believer in stone energy, you will love the combinations that come through in long, lightweight earrings and adjustable length necklaces. Pat recently learned the alchemy of high-karat gold fused to steel. She alloys her own 18-22 karat gold to achieve a variety of subtle colors that embellish the nature-inspired shapes and motifs. Amaral Munoz, of Santa Fe and Durango, utilizes all the latest tools and technology to produce his popular line of silver and gold necklaces, bracelets and earrings. He often uses a hydraulic press to form jewelry that has a beautiful modern, industrial flair. 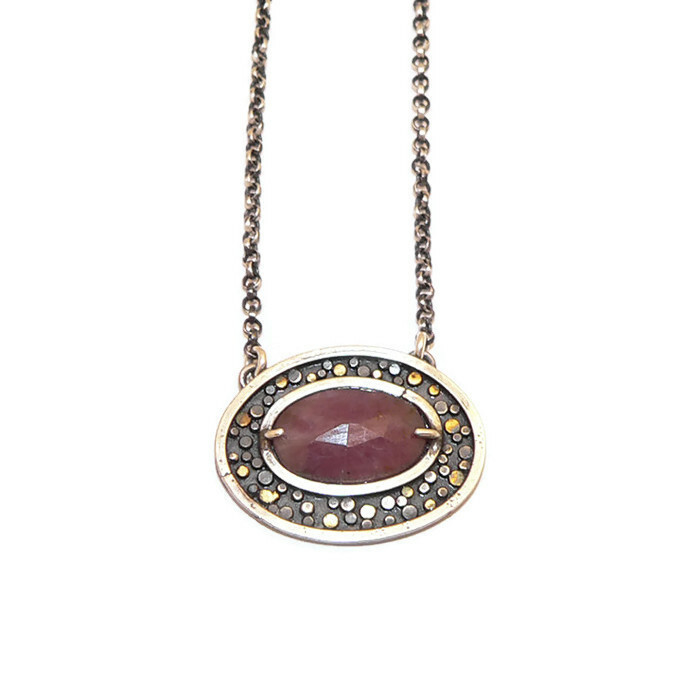 His geometric-shaped gemstone necklaces are flattering and unique. 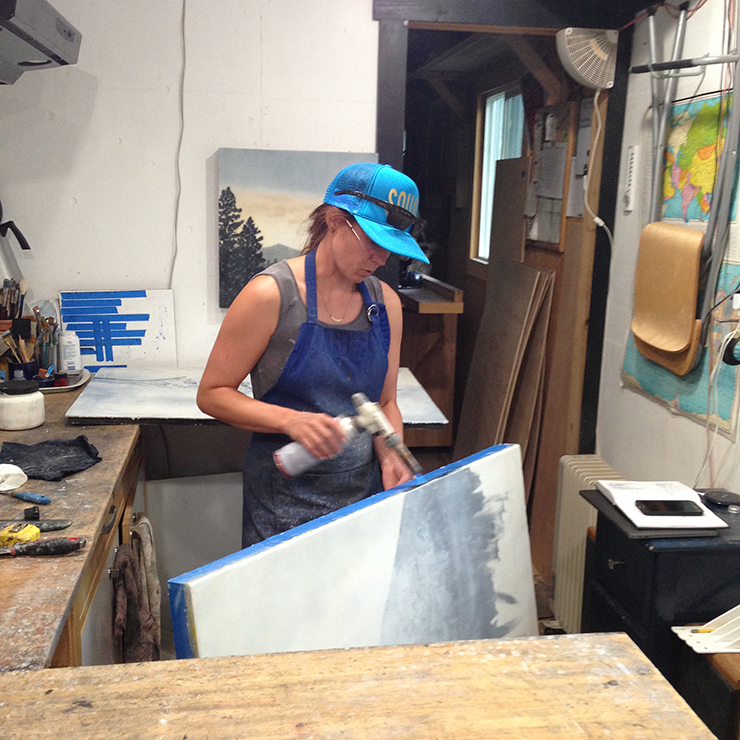 Allison Young lives and works in Montana and is one of the most recent additions to our gallery. Allison crafts large, lightweight earrings as well as smaller shield-shaped pieces that are flattering and well-crafted. She often combines multiples of a shape to provide interest and movement in her gold and sterling jewelry. Looking around the gallery right now, I am struck by the number of times my eye rests on something aqua. Bridgette Minehold’s new body of encaustic paintings, with that lovely, restful aqua hue. Diane West’s new aquamarine rings, varying in tone from grey-green to light blue. Krista Harris’ gorgeous palette including the uncommon use of aqua in combinations that one only encounters in Krista’s unique paintings. Amaral Munoz’s long aquamarine and gold vermeil necklace. Pat Hartman’s new necklace and earrings in green aquamarine combined with sparkling apatite. Susan Kinzig’s artistic polymer and sterling necklace. All around me---aqua! So, I am inspired to look a little deeper to see what our mutual love of the color might bring to light. Researching the stone, I am not surprised to learn that in the Feng Shui tradition, aqua is said to be calming and soothing (yes, it is that!) and carries the purification properties of water. The aquamarine stone is said to bring empowerment and the ability to respond rapidly. It invites open communication, thus healing old wounds and encouraging forgiveness. In a world struggling with age-old conflicts and an environment in need of quick action on our part, aquamarine is what the world needs now. That, and love. Enjoy the photos and come by and see these new works in person. Spring is in the air and new art is arriving to celebrate the season! Durango is beautiful this time of year and the art scene is no exception. So many of the artists represented by Diane West Jewelry & Art are inspired by nature and this is evident in their new creations. Stop in to see juicy new jewelry designs by Tracey Belt, Amaral Munoz and Pat Hartman.